The Leading Executives Advancing Diversity (LEAD) Network and EY today present the publication of the LEAD Gender Diversity Scorecard, the first-ever survey to measure gender diversity among executives in the European retail consumer goods industries. The LEAD survey comprises 30 companies in the retail and consumer-packed goods (CPG) sectors Europe, representing more than $675 billion in annual sales. On average, it found that women hold 26% of executive positions in these industries in Europe, exceeding the global average of 16%1 but still far from gender parity in sectors where women account for the majority of customers. The leading CPG manufacturer is U.S-based consumer goods group Procter & Gamble, which reported 32% female executives. 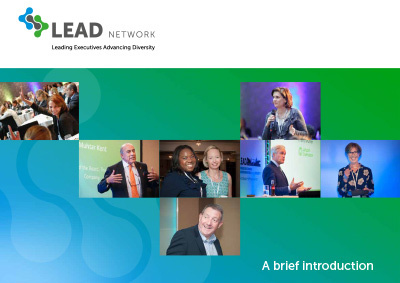 “We are proud of the progress we have made towards equal gender representation at all levels at P&G and to support LEAD’s efforts to increase diversity across our industry,” said Gary Coombe, President, P&G Europe. 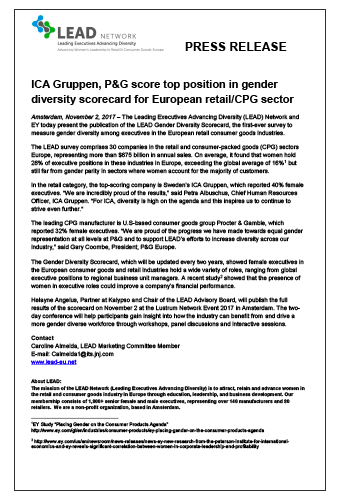 The Gender Diversity Scorecard, which will be updated every two years, showed female executives in the European consumer goods and retail industries hold a wide variety of roles, ranging from global executive positions to regional business unit managers. A recent study2 showed that the presence of women in executive roles could improve a company’s financial performance. Helayne Angelus, Partner at Kalypso and Chair of the LEAD Advisory Board, will publish the full results of the scorecard on November 2 at the Lustrum Network Event 2017 in Amsterdam. The two-day conference will help participants gain insight into how the industry can benefit from and drive a more gender diverse workforce through workshops, panel discussions and interactive sessions. 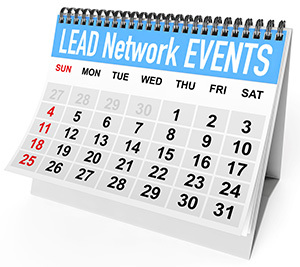 The mission of the LEAD Network (Leading Executives Advancing Diversity) is to attract, retain and advance women in the retail and consumer goods industry in Europe through education, leadership, and business development. Our membership consists of 2,000+ senior female and male executives, representing over 140 manufacturers and 80 retailers. We are a non-profit organization, based in Amsterdam.